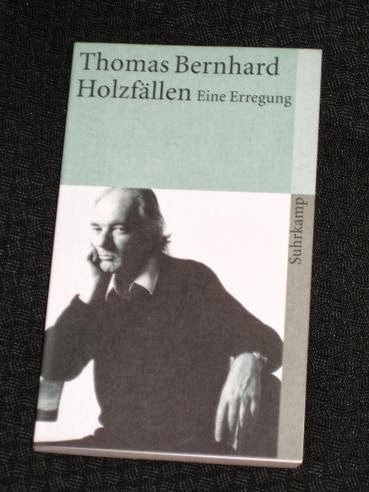 That man, of course, is the barely-concealed alter-ego of Austrian writer Thomas Bernhard, and the book is his novel Holzfällen (Woodcutters***). It’s a deceptively rambling novel, a story that unfolds over more than three-hundred pages of circling vitriol from a man who despises the company he finds himself in. This arty supper, ostensibly in honour of a famous stage actor, happens to coincide with a rather more sombre event, the funeral of a former friend. Joana, a failed dancer and actress, hung herself in her home in the country, and the narrator (a thinly-veiled Bernhard) and the rest of the Viennese cultural milieu have paid their final respects before moving on to an evening of food and theatre chatter. Holzfällen is my first view of Bernhard’s world, but it was pretty much everything I’d expected it to be from the reviews and comments I’d read. The thirty pages or so that I read in the first sitting were a confronting, circular mass of sentences, deliberate repetition building into a dizzying wall of words seemingly intended to obscure meaning and prevent progress into the heart of the story. Slowly though I began to make headway, and once I’d become more accustomed to the style, the story started to make sense. Again and again, we return to the focal points of the story, the writer sitting in his chair, and the moment when he accepts the invitation from his former acquaintances, thus undoing the work of several decades of exile in a moment. The supper he has come to take part in, with its self-gratulating writers and alcoholic musicians is unlikely to soften him in his views. The central image of the writer sitting and thinking in his ‘Ohrensessel’ (translated as ‘wing chair’ in the English version) is one of a tyrant sitting in judgement over the guilty. From his dark corner, he can see the other guests in the brightly-lit room while they can only see an outline through the clouds of cigarette smoke, a vaguely-suspected image sitting silently and yet with a presence felt from a distance. He casts down his unheard thunderbolts on the uneasy Viennese, punishing them mentally for their fakeness, their unceasing pursuit of public honours and, above all, for their ceaseless chatter. The English-language version (Woodcutters, translated by David McLintock) is available from Faber and Faber. I have this on the shelf but haven't got to it yet… I read Concrete and loved it. Concrete reminded me of Dostoevsky so I'm hoping that there are traces of the master in other novels from Bernhard. A couple of weeks ago I have started a major rereading project of Bernhard's works. I started with Woodcutters, then continued with The Lime Works, Gargoyles, The Loser and right now I am about to finish Correction. Concret is upcoming. But speaking of influences,Correction seems to have been a major, major influence on Krasznahorkai's writing, in particular War And War. oh, yes, Bernhard was a big admirer of Dostoyevsky, traces everywhere, I would say. I have been wanting to read Thomas Bernhard for awhile. I really like both the imagery and the concept that you describe, that if the judgmental writing sitting in the chair.